My NYU Department developed programs in Food Studies based on the premise that food is so central to the human condition that studying it is a great way to get into much larger social questions. I’ve just found a terrific example in the April 9 New York Review of Books in which Michael Tomasky reviews So Damn Much Money: The Triumph of Lobbying and the Corrosion of American Goverment, by Robert G. Kaiser. I immediately ordered a copy. According to the review, the book chronicles events in the history of a Washington, DC lobbying firm, Schlossberg – Cassidy, run by former staff members of Senate Select Committee on Nutrition and Human Needs, chaired by George McGovern (Dem-SD). The firm parlayed its thorough knowledge of food assistance programs into a consulting practice devoted to helping corporations deal with pesky regulations and policies that affect agriculture, food, nutrition, and health. To give just one example: the firm’s first academic client was Jean Mayer, the nutritionist president of Tufts University. He recruited the firm to get Congress to appropriate $27 million for a national nutrition center at Tufts. The result is the USDA Human Nutrition Research Center on Aging at Tufts University. But this first earmark set a precedent that led to today’s deeply corrupt system of rampant congressional earmarks, election campaign contributions, dependence on polls and focus groups, and climate of political partisanship. 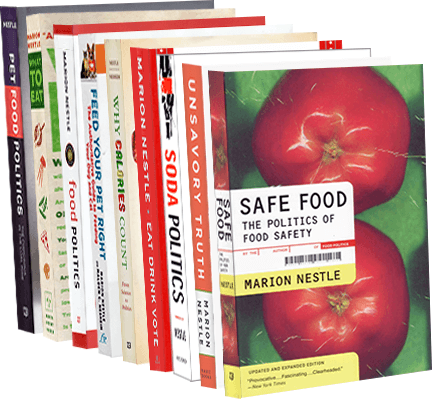 A book about food lobbying and its larger political and social consequences! I can’t wait to read it.